A new generation of the car that’s always been touted as the best-handling in its class. Kia claims an improved drive, higher quality and more interior space for its new hatch. De­finitely not a new model, but the one to beat, because it keeps on ticking all the boxes. If car buying can be likened to marriage (stay with us; after all, both involve commitment and spending long hours together), superstition says you’ll need something old, something new, something borrowed and something blue. Well, playing fast and loose with the analogy, we have something old by way of the Skoda Octavia. That’s not being disparaging; we’re simply stating that this generation has been with us since 2013, although it was given a makeover last year. Throughout that period, the Octavia has sat at the summit of our family car class, primarily because it’s huge inside, plus there’s very little it doesn’t do well. For the ‘something new’, we have the Kia Ceed. In case you haven’t heard, Kia is on something of a march these days. 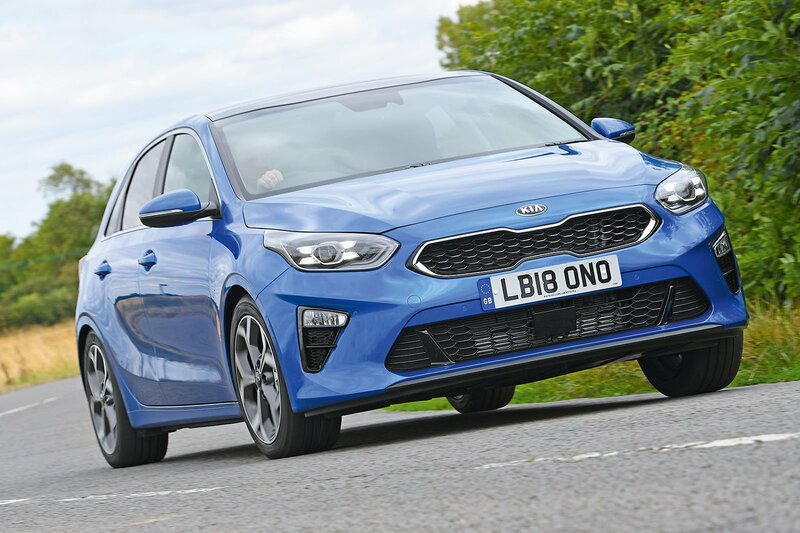 This new Ceed is from a generation of models that includes the Picanto city car and the Stinger executive five-door coupé, both of which excelled in our Car of the Year Awards earlier this year. The Ceed, then, is far from the underdog. Something blue is the Ford Focus, from the manufacturer with the Blue Oval logo. It’s also a new model, which Ford knows it has to get right. That’s why it has re-engineered the car from the ground up with the aim of reinstating it as the class leader for ride and handling, while also looking to improve on the outgoing model’s iffy interior quality and limited rear seat space. So what’s been borrowed? 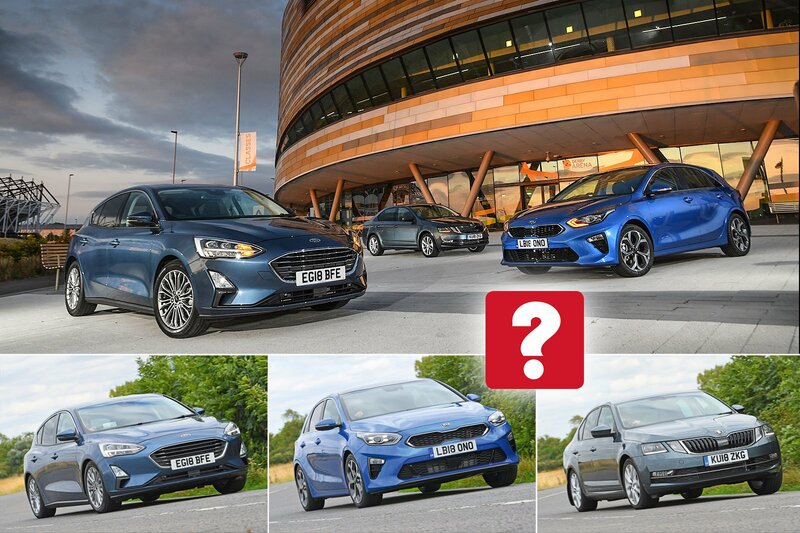 Well, all three, as it happens, from their manufacturers, so that we can put them through our rigorous tests and tell you which is the best family hatch on the market. The eagle-eyed among you will have noticed that there’s a power imbalance at play here. Indeed, with 148bhp, the 1.5-litre four-cylinder engine in the Octavia meters out the most welly, followed by what’s the pokiest petrol in the Ceed range: a 1.4 with four cylinders and 138bhp. Now, you can have a 1.5-litre Focus with 148bhp, but that pushes up the list price well beyond those of the others. So, to get something approaching price parity, we’ve lined up a 1.0-litre three-cylinder Focus with 123bhp instead. Clearly, then, the Focus isn’t going to win any sprint races. While 0-60mph in 10.2sec is respectable, the Focus is soundly beaten by the others, with the Ceed chalking up 8.8sec and the Octavia 8.4sec – both quick times. 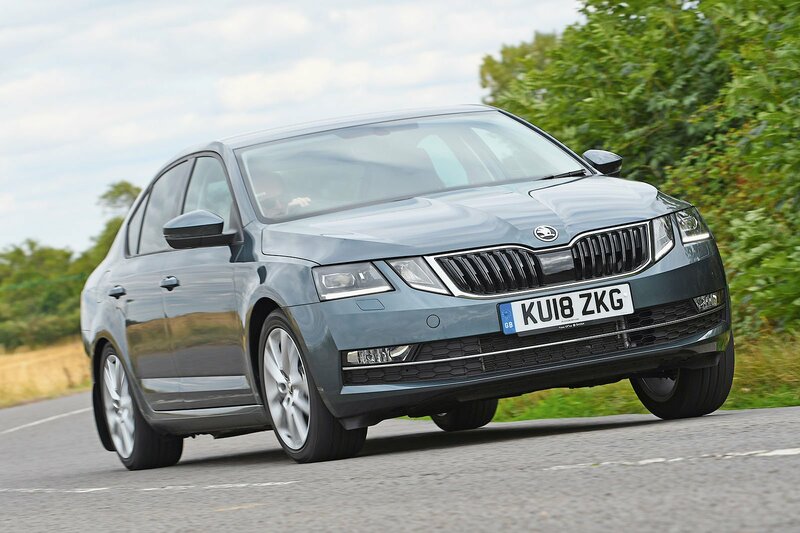 It’s the same story going from town to motorway speeds through the gears, with the Octavia extending its advantage over the Ceed by posting 7.9sec for the 30-70mph sprint, versus 8.7sec. The Focus managed 10.1sec, and it feels the most measured, revving out steadily rather than keenly like the engines in the other two. Put simply, the Focus lacks the gutsiness of its rivals, and this shows up most obviously when you leave it in a higher gear and put your foot down. While the Octavia and Ceed can hang with the ebb and flow of traffic quite easily, the Focus requires you to drop at least one cog to keep up. In terms of engine refinement, the Focus both giveth and taketh away. Even at low revs, its engine chirps away routinely in the background, more so than the others, but the noise is muffled and never abrasive. Of the four-cylinder motors, the Octavia’s sounds slightly sweeter, yet both emit a louder roar than the Focus’s when you accelerate hard. They’re better balanced, though, transmitting fewer vibrations back at you through the controls. Mind you, the Focus is by far the quietest at motorway speeds. Although it whips up the most wind noise (mainly from its door mirrors), that’s more than offset by a relatively low level of road noise, making it the most relaxing to drive over long distances. Wind noise isn’t too bad in the Octavia, but the drone from its tyres at 70mph and thuds from its suspension can become quite annoying. At motorway speeds, the Ceed burdens you with even more road roar, but it counters with slightly less wind noise than the Octavia, so in the end there’s little in it between these two. The Octavia’s feelsome clutch and progressive accelerator and brake pedals make it the easiest to drive smoothly, while the Focus’s marginally less distinct clutch action and the Ceed’s hair-trigger accelerator make you more susceptible to a jerky getaway. The Ceed’s gearchange could also be slicker, and while the Octavia’s is better, it’s not a patch on the Focus’s delightfully smooth and precise shift action. And there’s your clue as to which of these three will most tickle a keen driver’s fancy. 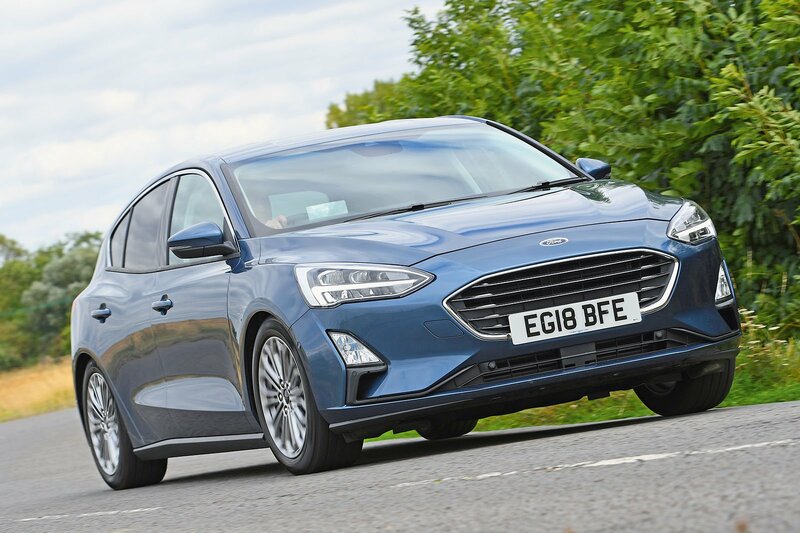 Yep, if you’re the sort who eschews the quickest route for a meandering back road just for fun, you’ll adore the Focus; it’s as good as it gets in the family car class, let alone this test. For starters, the steering couldn’t be much better; quick, consistent in its responses and ideally weighted, it connects you intrinsically with the front wheels and, as you turn in to corners imbued with the confidence this elicits, the rest of the chassis shines, too. 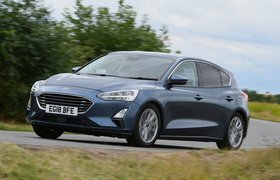 There’s loads of grip and the car feels delicately balanced front to rear, while deft damping gives the Focus the ability to remain unfazed by uneven roads that would have the other two struggling to control their mass. But while neither rival can hold a candle to the Focus’s handling finesse, they aren’t tugboats by any stretch. Sure, the Octavia leans the most in corners and is the least wieldy, but it steers and grips well enough to feel utterly surefooted and predictable. Its most annoying trait is actually nothing to do with cornering, but a tendency to wander within its lane on motorways, requiring you to make continual minor corrections. The Ceed’s relatively quick steering initially makes it feel alert and agile, but thereafter its steering isn’t as feelsome as the Focus’s nor as progressively weighted as the Octavia’s. Yes, it changes direction more eagerly than the Octavia, with less body roll and more grip, but along bumpy roads it actually feels the least composed of the trio. The final dynamic question concerns which of these three has the comfiest ride, and it’s the toughest one to answer yet, because they all have strengths and weaknesses. For instance, the Focus just edges out the Ceed for compliance over craggy town roads, while the Octavia thumps the most over anything with a sharp edge – not just in town but at higher speeds, too. However, break out from the confines of the city onto a motorway peppered with small surface ripples and the Octavia’s supple suspension absorbs them the best. Under these conditions, the Ceed and to a lesser extent the Focus are more restless. To be clear: none of these hatches is fractious, but the Focus is the most comfortable the majority of the time.